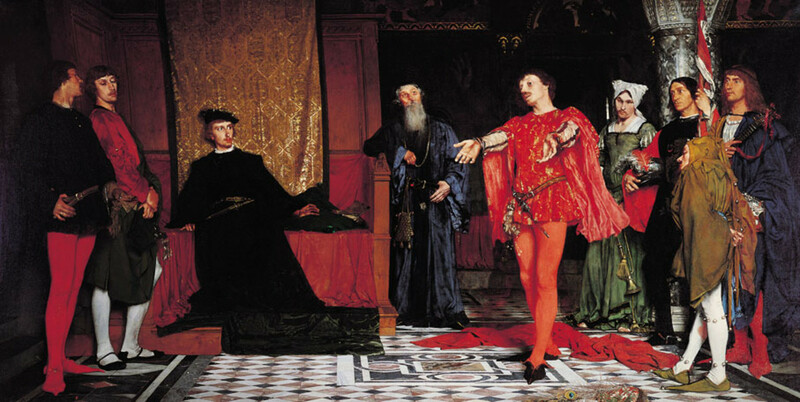 Follow along with this article to study three sonnets in Romeo and Juliet. This article will also provide a complete review of rhyme scheme and iambic pentameter. 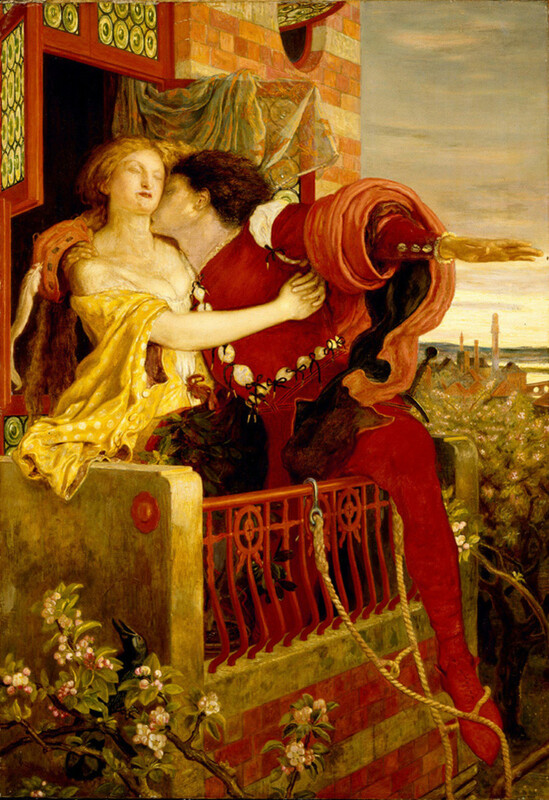 The prologue to Romeo and Juliet is the first sonnet the play.The dialogue that makes up the lovers' first kiss and the prologue to act II are also sonnets. The prologue to Romeo and Juliet (Act I) is a sonnet. 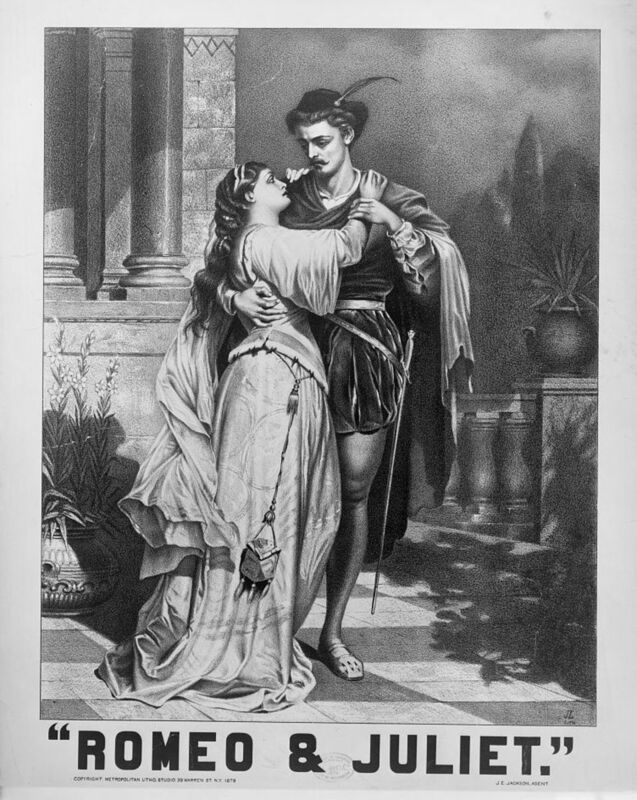 The prologue to Romeo and Juliet follows the 14 line, rhyming format of a sonnet. It maintains iambic pentameter, another key element of the sonnet. We can see that it contains a light change of meaning in the last two lines. This is known as a "turn." Let's just take a look at how the sonnet breaks down on the page, then we will look at the meaning of the words. You may notice the letters at the ends of each line. Those are the designations for the rhyme scheme. You will also notice that the prologue is divided into three stanzas, followed by a couplet. The prologue opens by saying that two great households in the city of Verona have a long-standing feud, that will soon break out into violence. The two feuding families both have children. 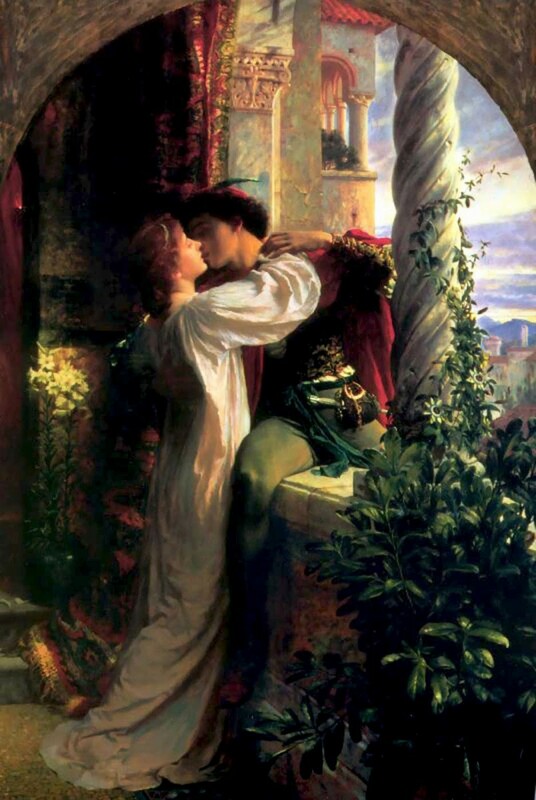 Those children, Romeo and Juliet, are fated to fall in love. That love leads to tragic events that spring from misadventures and misunderstanding. The two young lovers will die, and ultimately end their parents' fighting. The prologue proceeds to explain that this play will show the story of these two lovers form beginning to end. 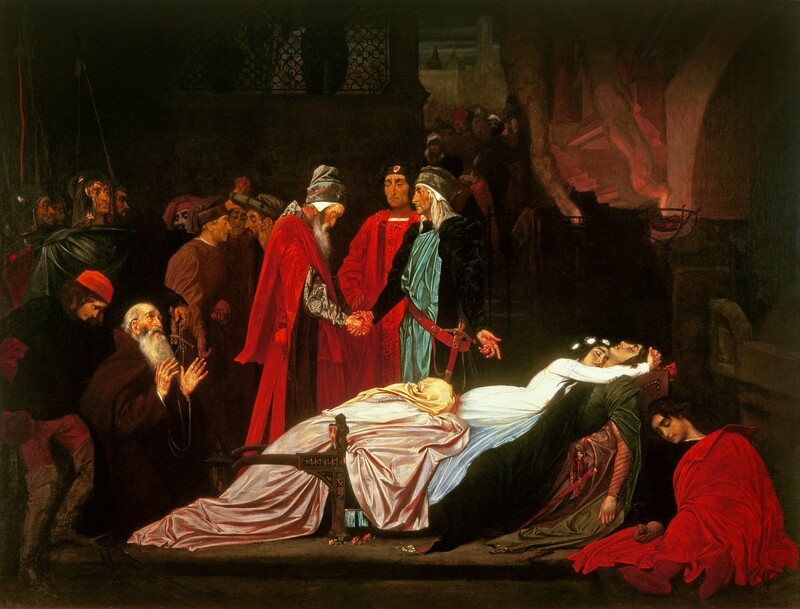 It also says that the only thing that could end the fighting between the families is the death of Romeo and Juliet. In the last couplet, the meaning "turns" from talking abouthe content of the play to how it will be performed. This fits with the structure of a sonnet, where the last two lines change the meaning. This prologue served to focus attention and prepare the crowd.The very beginning of the play sets up the action, and even tells us that the ending will be tragic. 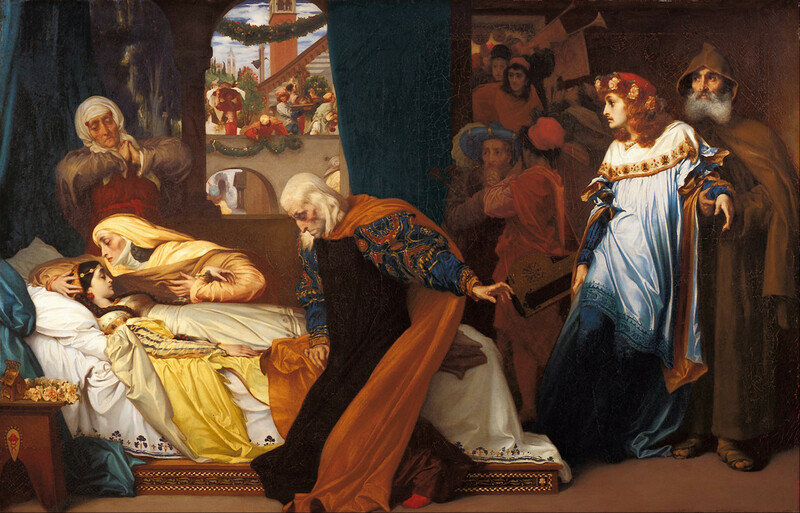 For a more detailed discussion, read a line by line analysis of the prologue to Romeo and Juliet. 5 Pairs of syllables or "iambs"
Not sure what "Rhyme Scheme" is? Don't worry. Here's a quick tutorial. We are all familiar with words that sound the same being used at the ends of lines. We don't think of it that way, but that is all an end rhyme is- at least as far as this study goes. The "end rhyme" is any set of words at the end of a line that sound the same. Simple, right? Of course. But it can get much more complicated. In this case, the words in all caps rhyme with each other. The words in bold print also rhyme. If we were to read more lines of this poem, we would quickly run out of ways to show which words rhyme. We can't use bold print and capital letters, it's too complicated, too limited, and it takes away from the poem. So, we use letters to show which lines rhyme. There are plenty of letters, so we should be able to make them work for ANY poem we read. We want to have a name for this that sounds fancy, so we call it rhyme scheme. In the example above, the group of lines has an ABAB rhyme scheme. In the last two lines, the sonnet usually also has a change in meaning or "twist" ending. This sonnet is unusual- It is spoken by two individual voices. But, it is a sonnet just the same. Note that it follows the correct rhyme scheme, rhythm, and structure as a traditional Shakespearean sonnet. 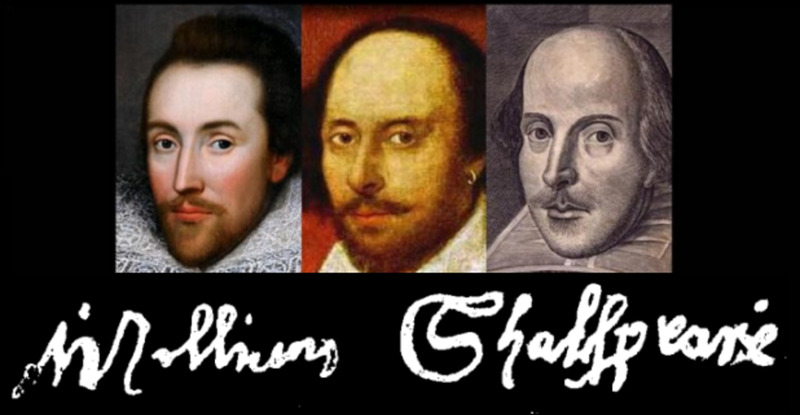 The only difference is that two characters speak in turns to create the sonnet. In all other respects, this is a typical sonnet. It even contains the required "twist" with the ending couplet. Romeo is cleverly asking for a kiss. He says that if my chance his rough hands happen to scratch Juliet's skin, he will kiss away any annoyance. Sometimes, this scene is played with Romeo touching Juliet's lips with his fingers. Juliet is equally clever here. She says his hands are beautiful and smooth. But,she also says that two hands can touch together as easily as two lips. In this, she places her palm against Romeo's palm, and says that this is a pure and holy way to kiss. Romeo tries again, asking if saints also have lips. Juliet replies that those lips are meant for prayer. Romeo, not to be deterred, continues to beg for a kiss by saying- "Let our lips touch together just as our hands have touched." The wordplay is more complex than this, but this is the basic idea. With this final twist, Juliet says that saints remain still. So Romeo says that Juliet can choose not to move, and still grant his prayer. He leans in and kisses her, winning the battle of wits. Not sure what IAMBIC PENTAMETER means? Each line has 10 syllables, divided into five sets. Each set of two syllables begins with one unstressed syllable. The first, unstressed syllable is followed by a stressed syllable. The capitalized syllables are given more stress or emphasis. If you notice, the emphasis can be made within a single word or between two different words. The important thing is the pattern. It looks odd like that, doesn't it? But it does show how the rhythm is supposed to go. In a Shakespearean sonnet, every line follows that same rhythm. Sometimes it is so subtle that we don't even notice it. But if it's a Shakespearean sonnet, the rhythm is always present. This rhythm even has its own name. It's called Iambic Pentameter. Why Iambic Pentameter is called "Iambic"
There is a name, in poetry analysis, for a set of two syllables that begins with one unstressed syllable that is followed by a stressed syllable. That name is an "iamb." An "iamb" is always a set of two syllables, with one unstressed followed by a stressed syllable. So, the rhythm of the Shakespeare sonnet is called "iambic" because it comes from, or is made up of, a series of iambs. Why Iambic Pentameter is called "Pentameter"
The "pentameter" part is a little easier to figure out. "Pent" is a root word meaning five. There are five iambs in each line. These five iambs go together to create a rhythm, or meter. Hence, the term for this rhythm is pentameter, or "five-meter." When we put all these together, we get the term Iambic Pentameter. All Shakespearean sonnets are written in iambic pentameter. A video tutorial on iambic pentameter. 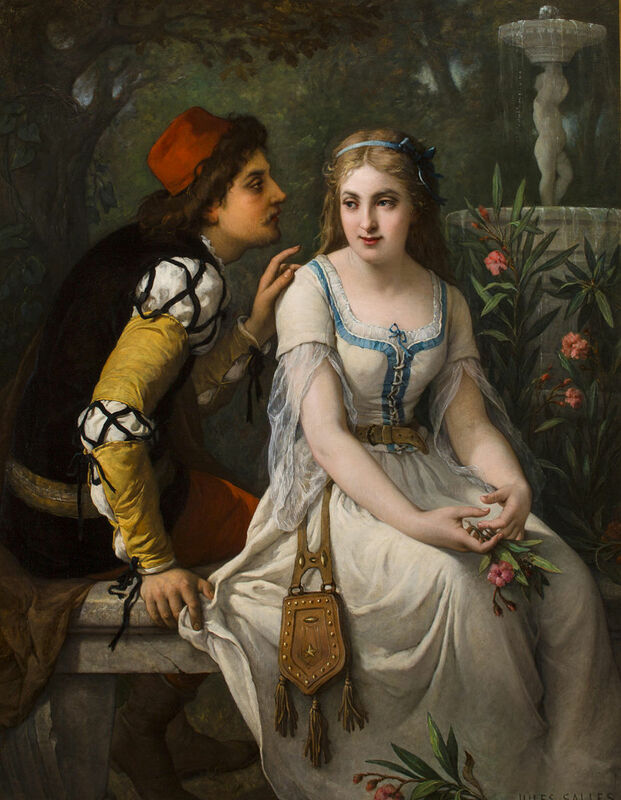 This third sonnet reviews the action of act one, and prepares the audience for act two of Romeo and Juliet. On the surface, it might seem to be less interesting than the first two sonnets in Romeo and Juliet. A closer look reveals that this third sonnet is a very good example of a sonnet's structure. This sonnet has three distinct stanzas that each have a nearly complete meaning on their own. Because the meaning is so complex, there will be additional notes after each stanza. The three stanzas build upon one another to increase the tension and conflict. In the final couplet, there is a twist, or change in meaning. Hence, the words and meaning of this sonnet perfectly illustrate the prescribed structure. This stanza recaps Romeo's former love for Rosaline, and how he has exchanged that love for Juliet. Take note that all stanzas still have the rhyme scheme of ABAB, in iambic pentameter. 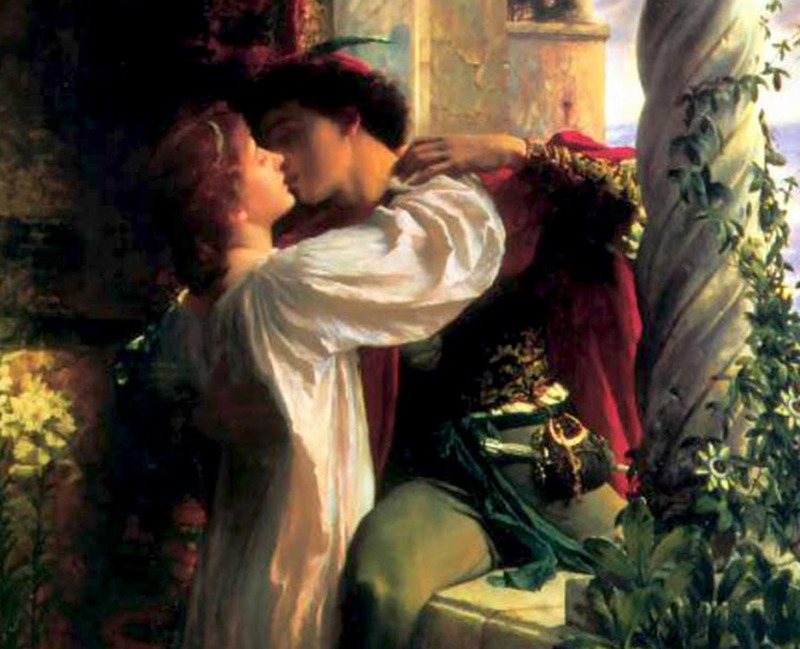 This stanza describes the love Romeo now has for Juliet, and the fact that it must be secret. It hints at the conflict that will face the lovers, but does not give details. This stanza elaborates on the conflict between the families and heightens the tension by describing how it affects these two young lovers. In some sense, it raises the question: what can they do? Seemingly, they can do nothing. This final couplet turns everything around by saying that the passion Romeo and Juliet have for each other will conquer all the obstacles. They will find the time and a way to meet in secret. The sweetness of their love will soothe them during their extreme distress.